As I mentioned in earlier posts, I want to interview the quilters who I have the highest respect and admiration for. I am thrilled and elated to offer this interview with Diane Gaudynski. 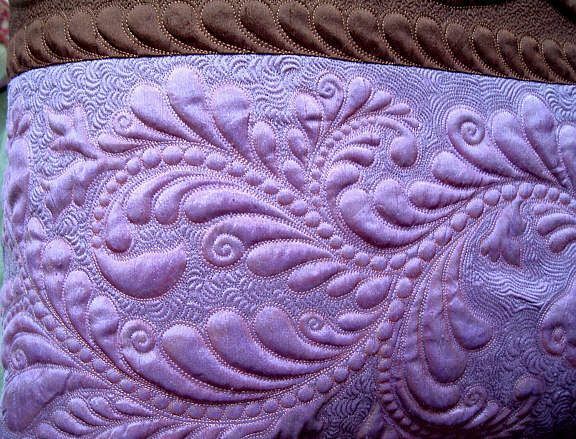 When looking at her work you can’t help asking yourself ; ” How is this quality of quilting perfection possible on a machine quilted work?”. The name Diane Gaudynski brings many thoughts to mind; award winning quilter, author, teacher, lecturer. She has accumulated a long long list of prestigious awards and honors. Her 2 books are amoung the best books available on machine quilting with a domestic machine. In 2002, Diane’s work was included in an international exhibit in Japan, appropriately titled 30 Distinguished Quilt Artists of the World. I heartily agree, Diane certainly has earned her place in the top 30. If you haven’t guessed by now, I am in awe of this woman. She is a quilt artist of the highest order and an excellent educator of her craft. I’ve gained more personal progress and more practical help from her first book, than I had from any of the stacks of other books I’d read on the subject. I’m realize I’m gushing, but you don’t cross paths with one of your personal “idols” every day. 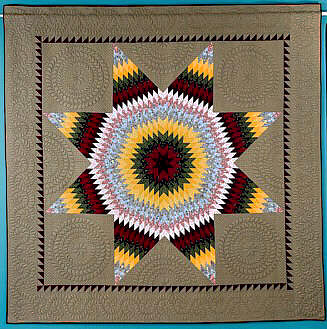 She began briefly as a hand quilter but in 1988 began quilting on her home domestic sewing machine. In the 20 years since her beginnings in hand quilting, she has perfected her craft, creating an impressive body of work that has attracted many awards and honors. The intricacy of her designs and perfection of the quilting will,will knock your socks off, to use an over worked cliche! If you are beginner or intermediate machine quilter, her books are “must reads”. If you’re experienced, but want your quilting to reach thatnext level.These are must have books for your libarary. 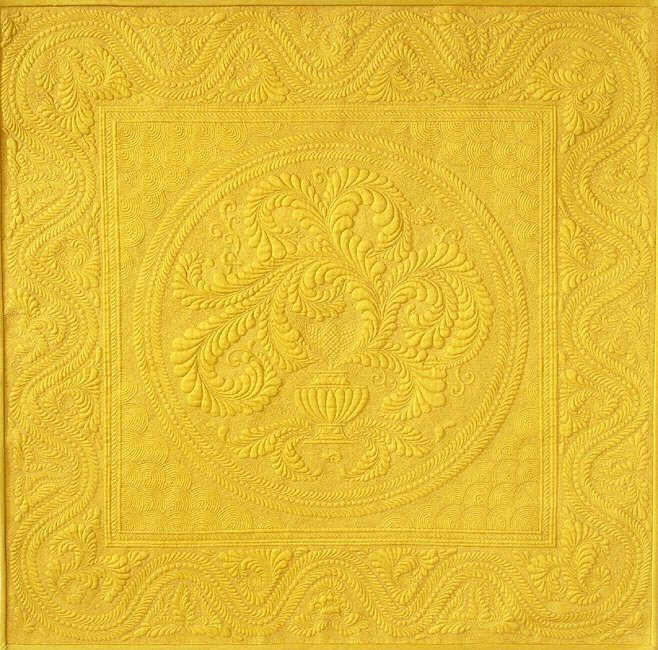 1-Your work has received so many accolades and awards, how did your interest in quilting begin? I was drawn into quilting slowly and somewhat reluctantly! I sewed all my life, so was very familiar with working with fabrics and a sewing machine. My mother began quilting during the quilt revival of the 1970’s, and every time I visited she plunked down her new black and white, and then color, Quilter’s Newsletter Magazine on the kitchen table and I’d thumb through it, thinking, nice but not for me. Later my youngest sister visited me for a summer when she was only 16 and taught me to piece. The challenge and geometry of it drew me in. After that it was the new fabrics, colors and designs, and the actual sewing at my machine that I dearly loved all my life that kept me interested. Quilts became an endless kaleidoscope of possibilities. 2-As you look at a quilt that’s ready to be quilted, where do your ideas come from? Could you tell us a little about your creative process? The key is to consider the quilting right from the beginning as you plan a quilt. It should work hand in hand with the fabric choice, design layout, your skill level, function, everything. I usually begin with the basic stuff, ditch quilting long construction lines, going around blocks and pieces for stability. More ideas will happen as I do this kind of work. However, most designs are planned at the beginning, I make a sketch of the quilt top and note what I want to quilt, and where. Some marking is done, and then it evolves as I make the quilts. I used to look to similar vintage quilts for a starting point, and now know what works best from experience, and always try to add new and special designs for each quilt. I look for ideas from nature, architecture, things I collect like dishes, antiques, and hand-made jewelry, and simple shapes and lines that are pleasing. I find the more I quilt the more I look outside of quilting for inspiration, and the simpler my designs have become. 3–Who or what have had the most influence on your work? First and still influential were the quilters of the past with their art, skills, and fabulous quilts made from whatever they had, limited tools, supplies, and lighting. Their art and ingenuity combined with technical skills always amazes me. In our modern quilting world many quilters have influenced me. I learned my machine quilting skills from Harriet Hargrave’s book Heirloom Machine Quilting after hearing her lecture, and Marsha McCloskey inspired and taught me with her piecing instructions and use of color. I loved “Quilter’s Newsletter Magazine,” “Ladies Circle Patchwork Quilts,” and “American Quilter” from AQS. I read and re-read each issue. Jinny Beyer, Georgia Bonesteel, Caryl Bryer Fallert, Deborah Wagner, all inspired me with their groundbreaking work. Vintage Amish quilts were a revelation to me with their graphic simplicity, ornate quilting, and colors that I felt were my own. When the various state quilt history books were published, I always read those and loved all the photos and information in them about the history of quilting. 4-Are there any contemporary quilters or quilt artists that you specifically admire? I love the work of many contemporary quilters, including Linda Roy, Sandra Leichner, Zena Thorpe, Ann Fahl, Sue Nickels, Pat Holly, Margaret Docherty, Jane Holihan, Caryl Bryer Fallert, Hollis Chatelain, Shirley Kelly, Denise Havlan, and so many more. I am continually amazed at what is being done in quilting now. 5- How has all the recognition and acclaim effected you as an artist? At home nothing really changed as recognition for my work grew, but it did give me more confidence in my quilting. I am more willing to share my ideas and techniques because they have proved their value in the world of quilting. I also feel more free to do what I want and try new things in my work. 6-What have been your proudest accomplishments to date? Sometimes I think it might be catching the connecting flight in Phoenix, but really it is my quilts and successful teaching that give me pride. I think being judged Master Quilter by NQA, winning 5 Bernina Machine Workmanship Awards at Paducah and having 6 quilts in the National Quilt Museum there, having a quilt in the permanent collection of the International Quilt Study Group in Lincoln, NE, being included in Robert Shaw’s book American Quilts, the Democratic Art, 1780-2007, and winning the Founders’ Award at Houston are my proudest achievements. Perhaps my miniature quilt “A Visit to Provence” is my best work, and I also am proud of the two books I’ve authored. Whew. 7–What do you do for fun [besides quilting]? I love to read, cook, have lunch with quilting friends where we talk at length until the next meal service is being readied, spend time with my cat Oliver and soak up the love, spend time with family, and watch MI-5 and Project Runway on TV without fail. 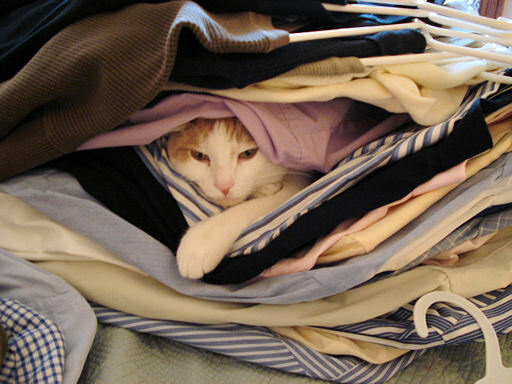 8-Share with us something funny that has happened to you recently. Mostly it is “senior moment” instances, huge satellite delays in remembering things, or not being able to read the controls on my new car and turning on the heated steering wheel instead of cruise control because the little icons are so vague, then wondering why my hands are sweating as the car slowly loses speed. It’s hard to drive while wearing reading glasses! 9-How have you handled the business side of your career? I have kept my business simple and straightforward, don’t sell many things, haven’t done much to advertise or promote myself other than post a website way back when and make quilts, write books, and teach. My students advertise my classes with their results so I have had a busy and rewarding career in teaching. My bookkeeping is basic and simple, I have no staff except my cat and laptop. I manage my internet site and blog myself, and try to answer emails from quilters. 10- What advice would you give an aspiring quilter just starting out? Learn to focus. There is so much available, so many styles, techniques, materials, that it can be overwhelming at first. Determine what your goal is, where you real passionate interest lies, what you want to do in quilting. Is it for fun or will it be a career, then make decisions based on that. Learn the basics, then create your own look and style that will stand out and reflect what you love in the whole spectrum of quilting. Hone those skills and become good at the ones you use in your own work, but be familiar with a wide variety so you know what is available for you to add to your work to keep it fresh and interesting. Be creative. Always learn from the past and from the rules, then create the new. 11-How would you describe your quilting style? My quilts fall into the “traditional” genre, and are pieced in subdued colors, not busy, with spaces for quilting. I have often referred to them as everyday quilts with elegant Sunday-best quilting. I like to take a humble design like Log Cabin or Ohio Star and use great rich colors to create a top, then quilt it with wonderful intricate original machine quilting designs. Subtle and sophisticated, my quilts tend to glow rather than shout. 12-Describe yourself in 5 words. Loyal, creative, enthusiastic, stubborn, sensitive, not necessarily in that order. 13-What have been your biggest obstacles in achieving your success? I have some serious health problems that have definitely limited my quilting, travel, and other opportunities. I work around them when I can, and quilting has helped me deal with them. 14- What keeps you inspired and motivated? I think being around other creative quilters/people keeps me inspired. Seeing beautiful work, art in all forms, the beauty of nature especially when I travel, and taking time to let creative ideas mature all sustain my inspiration. 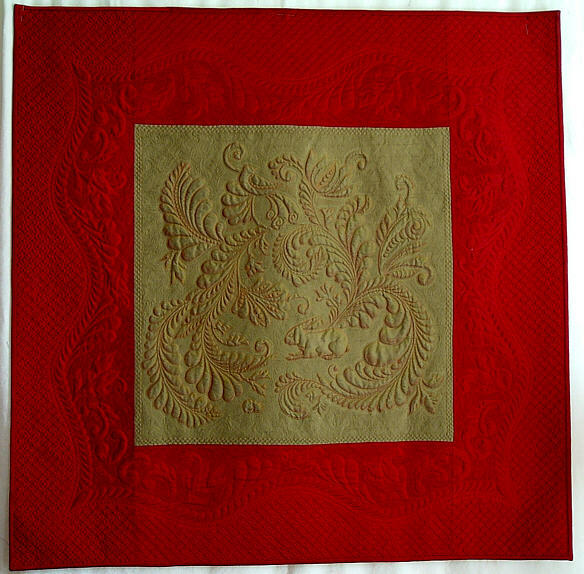 “A Visit to Provence,” 2002, wholecloth miniature quilt, 24″ square, original designs, cotton batt, cotton sateen fabric, silk thread. First place winner at the AQS Show in Paducah, first place in the NQA show , and 2nd place at the IQA show in Houston. Now part of the “Oh, Wow” collection of miniature quilts at the National Quilt Museum, Paducah, KY.
Click on the image for a closer look at the detailed work. Detail from “Mourning Too Soon,” a small silk strippy quilt made in honor of my mother, Erma Hinterberg, and part of the Alzheimer’s Art Quilt Initiative exhibit of quilts that toured the country to bring awareness and raise funds for research to fight this disease. The project was spearheaded by Ami Simms. Diane’s comments on this picture: Oliver, sleeping after destroying my sewing room. Great interview. Diane Gaudynski is my hero! You may have quessed from my blog, that’s she’s mine too!